The CRTV presenter and moderator of the programme, Matute Menyoli and members of his panel have received strange calls and mobile phone messages threatening them. Without any call to order from his boss, the station manager of CRTV, David Chuye Bunyui, on the 22nd of July 2014 slammed a controversial ban on the programme and issued a warning letter to Mola Matute on the grounds that he did not professionally handle the programme. This act received lots of criticism from members of the public who rely on the programme for sensitisation on the Fako Division land crisis and other issues. Many professional journalists have faulted Mr. Chuye for being influenced by those in power who have been accused of land grabbing. His decision to suspend the programme has been described as censorship and lack of professionalism on his part. 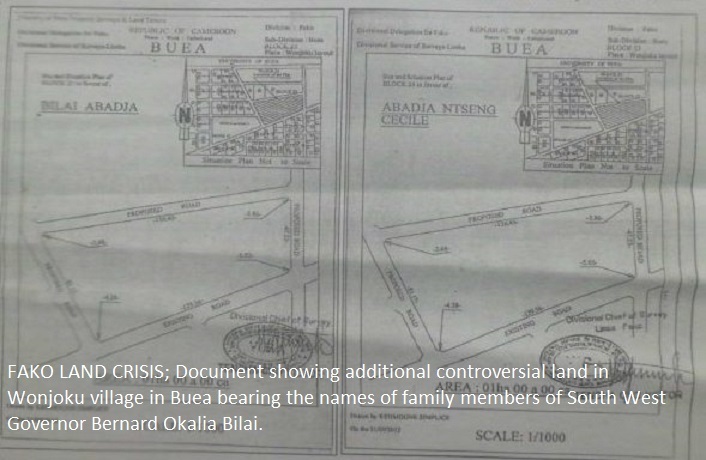 The banning of the programme provoked the journalists to result to using the print media this time to expose the accused more with documented evidence of hectares of land they have grabbed. 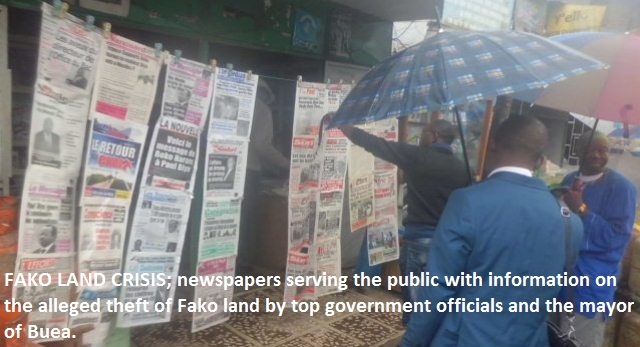 For the past weeks, the populace in Fako Division has been swarming newsstands to buy copies of papers with stories relating to the Fako Division land grabbing saga. The station manager, Mr. Chuye on the 26th of August 2014 issued a service note lifting the suspension of the programme under some strange conditions. He stated in the latter that the programme would have four moderators in the persons of Matute Menyoli, Mekole Henry, Manka’a Ambe and himself, Chuye Bunyui. He added that each week shall have a different Moderator who shall hold a production meeting with the panellists two days before the programme and shall submit a programme synopsis to the station manager latest midday on a day before the programme. He also stated in his service note that each moderator is expected to ensure decorum and check excesses from panellist, guest and callers and also that every edition must be recorded and two unedited copies submitted to the station manager. Mr. Chuye got his shock that none of his moderators or panellists he invited for a meeting showed up to discuss modalities on how to run the programme. So, the programme, ‘Press Club’ that was expected to re-commence on the 30 of August 2014 is still pending. The panellist (Buoddih Adams, Walter Wilson Nana all of the Post Newspaper, Chris Ambe of the Recorder Newspaper, Macdonald Ayang of Eden Newspaper, Dr. Ernest Molua of Entrepreneur Online, Barrister Ikome Ngongi, an elite of Fako Division, Mr. Tambe Tiku of the National Human Rights Commission and others) and the moderator Mr. Matute Menyoli of CRTV have denied working under such unprofessional conditions. The South West Region Governor, the SDO for Fako, Zang III, and the Mayor of Buea, Patrick Ekema have been mobilising some Fako Division chiefs who are their accomplices in swindling land and selling to enrich themselves to condemn Mola Matute Menyoli, Barrister Ikome Ngongi, Mr. Tambe Tiku and their team. Some chiefs, especially those of Bonadikombo, Botaland and Bonduma have resulted to intimidating youths who oppose the way they have been sharing land ceded to their villages. But unfortunately for them, the advocates of the Fako indigenous people, Barrister Ikome Ngongi, Human right activists, Christopher Tambe Tiku, a battery of lawyers and other Fako elites and sympathisers have taken the matter to the necessary quarters and sworn not to stop until the issue is redressed. So far, the Cameroon government has set up three commissions to investigate the matter and make a report. There is the National Anti-Corruption Commission (CONAC), an Inter-Ministerial Commission (made up of representatives of the Ministry of Territorial Administration and Decentralisation, the Ministry of Justice and the Ministry of State Property and Land Tenure) and the Military Intelligence from the Presidency who are grilling the accused and those complaining. 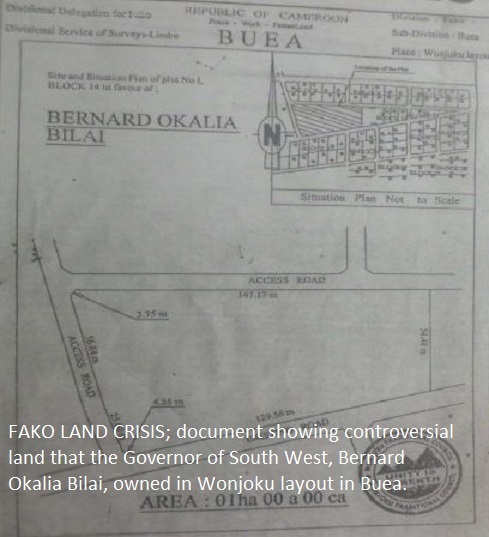 The advocates of the Fako Indigenous people have submitted evidence showing portions of land, some in hectares in areas ceded to Fako Villages for expansion and extension now belonging to government officials especially DO’s, SDO’s and even governor Okalia Bilai with land certificates. It should be noted that Mr. Matute Menyoli started doing investigations concerning how land ceded to the people of Fako Division was distributed in October 2013. After gathering lots of evidence, he started to raise issues using his programme. Initially, chiefs like Johnson Jokeh Njombe of Wokaka village used to be part of the panellists on Press Club. But after receiving a battery of questions from other members of the panel, he boycotted the programme after the second edition. Efforts to contact some other chiefs and administrative authorities on the programme to present their own side of the story has since then been futile.